Locus Map allows to use great vector maps with map data from OpenStreetMap. As OSM is an open project everybody can improve the map quality. This How-To is not meant to cover all the details for mapping on OSM, but it should help you, to get a step into it. It's quite easy to put roads, tracks, house numbers and POIs on the map. OSM really made some great work to help new users getting started. And you - as a Locus user - can be one of them! What do you get for mapping on OSM? Nothing! Yes, correct, NOTHING! Nobody gets anything. No Money! No fame! No honor! So why should you do this? Because you are using maps with data that has been collected by other volunteers around the world. It's just the good feeling to help someone else and say thanks by giving something back to the community. But enough talking now, time to get started! So far so good - this wouldn't be an article on the “Locus knowledge base” without mentioning a word how Locus can help you on this task. After recording a track with unmapped roads, simply go to “Data > Tracks > Chosen Category”, click on the track you've just recorded and hit export. On first time use, you will need to go through a simple authentication process. Enter the login data from http://www.openstreetmap.org/ and go ahead. 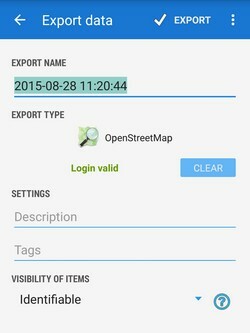 Now, Locus sends your track directly to the GPS traces in your OSM account. You can choose them to map the missing roads. This can't be done more easily! Sometimes it takes a while untill OSM servers have processed your upload. Please be patient. 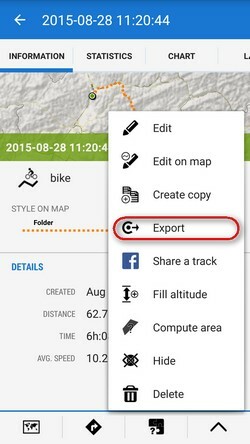 Now that you have your track in your OSM account, you can go right ahead and edit the map. Use “Potlach 2”, so you don't have to install anything on your computer. But feel free to use any of the other editing options. “Potlach 2” is just easy to start with. So I recommend this. But “JOSM” is way more powerful. I hope you have watched and understood some tutorials, because I will not explain here, how you use these tools. There are really better places to learn more details about OSM. There are really nice people willing to help you out with your problem. There are also support forums and you can even find and contact mappers around you. Give it a try! When you once got used to the vector maps in Locus and enjoyed their good quality, please share some of your time, to give something back. It's a Win-Win-Win-Win-Win-situation.